The Salvation Army’s call for 2,000 to 2,500 more State and social houses per year is strongly supported by the New Zealand Council of Christian Social Services (NZCCSS). 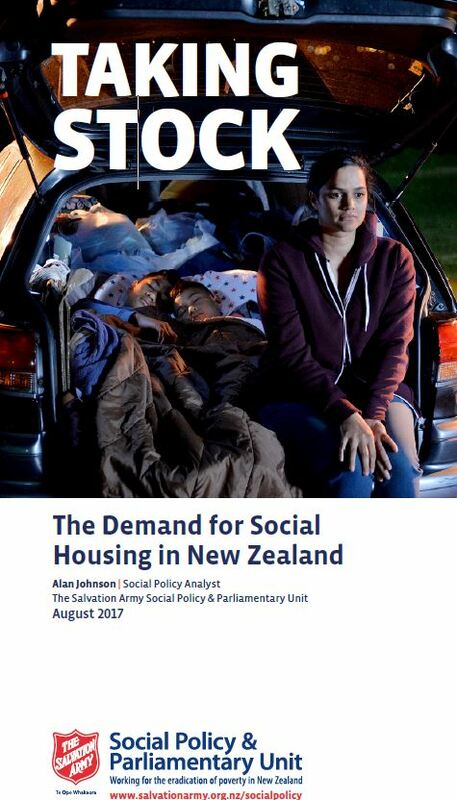 The Salvation Army report “Taking Stock; The Demand for Social Housing in New Zealand” provides a well-balanced but sobering overview of the actual levels of new homes which are needed to provide for low income New Zealanders now and in the future. “The serious impacts of homelessness on family and whānau wellbeing is constantly highlighted by our social services members”, said Trevor McGlinchey, NZCCSS Executive Officer. “On my regular visits to our members, homelessness and poverty caused by high rental costs and low incomes is regularly cited as the key drivers of ill-health, mental stress and low levels of educational achievement”. “The impacts of low quality housing and overcrowding on children are well-known and the lack of provision for their future through the provision of affordable, quality housing is a national shame”. This report highlights the emerging demand for affordable, quality rental homes from older New Zealanders. As more New Zealanders begin to reach retirement age without first owning their own home, the spectre of poverty for an increasing number of our older people also begins to emerge. Access to affordable, quality homes which provide long-term, stable tenancies is needed for many New Zealanders. Collectively NZCCSS members are one of the bigger NGO groupings of providers of social housing. “Our members support the call for more State and social housing to be made available, particularly in those areas with most demand”, said McGlinchey. “This report demonstrates the need for a rethink about social housing policy, recognising that for a large group of New Zealanders lifelong State and social housing options will be needed”. The call for a Government-funded house-building programme to help address the housing crisis and provide everyone with healthy, affordable homes with long-term tenure is one of the three immediate actions the 37 members of the Equality Network are calling for in their 2017 Election statement.